Recently we were approached by the conservator, Annabel Wylie, about making a perspex frame for 3D textiles. 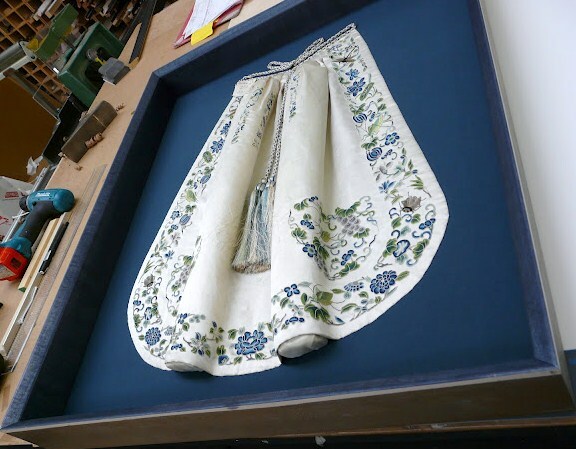 The textile in question was a ‘230 Year Old Apron’ which was mounted on fabric covered polycarbonate. Given the fact that perspex has a high degree of reflection we advised that a very deep frame, coupled with a generous space around the apron, would enable quite a wide viewing point and a better option. In addition to this, using our very special clear colour glass, being very clear and with UV filtering properties, it would appear as if the glass was almost not present. Given the intricate detail in the stitching and that perspex does not have UV protection, we also felt that the apron would really benefit from being protected from fading due to light. Our UV glass was the perfect answer to this problem. Finally, we stained the deep spacer to match the blue fabric on the mount board then framed around this with an antique effect silver frame, trying not to distract too much with the frame but to compliment the piece. 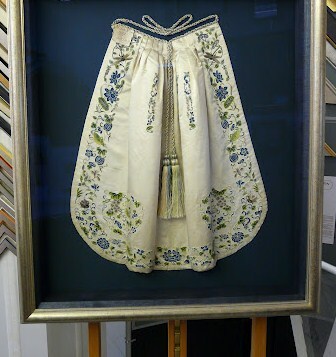 The final product really showed off the antique apron, enabling the viewer to get a full appreciation of the piece. Both Annabel and her client were delighted with the results. 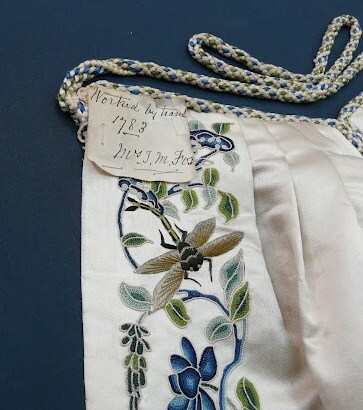 This new contact is important us as we are often approached by clients with very old needleworks in need of some restoration or conservation. We are now looking forward to working with Annabel on similar projects and are please to be able to offer her services together with our framing to all our customers.